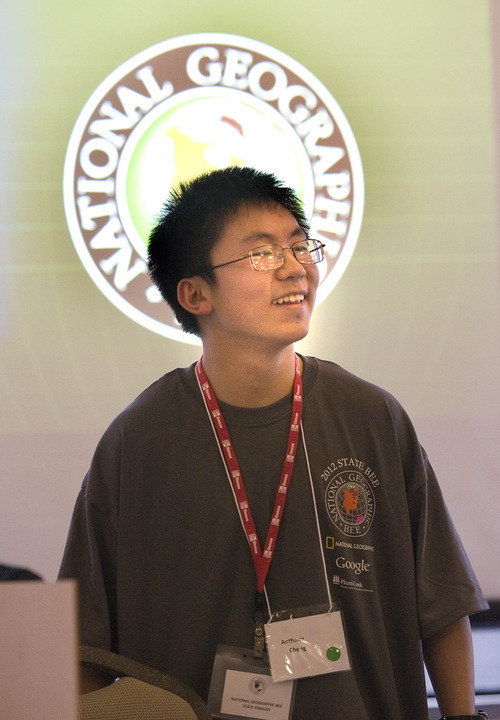 Youth will represent the state again at national bee in D.C.
Paul Fraughton | The Salt Lake Tribune Anthony Cheng smiles after being named the winner of this year's Utah National Geographic Bee held Friday at Thanksgiving Point in Lehi. Cheng, who has won the competition the past two years, will represent the state at the nationals in Washington, D.C., in May. Paul Fraughton | The Salt Lake Tribune Anthony Cheng, right, shakes hands with Will Hooper, who placed second in Utah's National Geographic Bee held Friday at Thanksgiving Point in Lehi. Cheng, who did not miss a single question in the final round, will represent the state at the nationals in Washington, D.C., in May. Lehi • Anthony Cheng, an eighth-grader at Midvale Middle School, can name obscure bodies of water, identify African nations by their neighbors and link U.S. states with their biomes. But it's doubtful many other U.S. kids  or adults  could match Anthony's prowess with geographic trivia. On Friday, Anthony, for the third year in the row, won Utah's state championship in the National Geographic Bee, earning a spot to compete in the national event in Washington, D.C., in May. One hundred students in grades four through eight jockeyed for the title at Thanksgiving Point in Lehi. Nationally, just 21 percent of fourth-graders, 27 percent of eighth-graders and 20 percent of 12th-graders scored proficient in geography in 2010 on the National Assessment of Educational Progress. And a 2006 National Geographic survey of young adults, age 18 to 24, found that 37 percent could not identify Iraq on a map and 20 percent believed Sudan was in Asia (it's in Africa). With rigorous testing goals for students in math and language arts under No Child Left Behind, loss of instructional time in social studies has been a "national concern," said Robert Austin, the State Office of Education's social studies specialist. "Our geographic literacy in this country is woefully inadequate," he said. "We really try to help students and teachers understand the importance of geographic awareness. There's really wonderful questions that students can ask about why people settle where they live, why certain populations seem to have so much natural resources and others so little, [and] why conflicts arise." But Austin expects Utah's new core standards to boost geography skills. Even though the standards are for language arts and math, students will be expected to be literate not only in traditional English texts, but in social studies, history and science. "I think it's the most important and significant reform for social studies teachers in the last 50 years," Austin said. "We expect kids who can read complex texts. We expect students to be able to write and craft arguments based on data. ... These are all huge life skills. And they're not the sole province of the language arts teacher." Sheila Keller-Powell, a retired teacher and the coordinator of Utah's geography bee, said students who do well in the contest are "all good readers." "A lot of their parents will say [their children have] been reading an atlas since they were 5 years old." Anthony estimated that "98 percent" of his geography knowledge comes from studying in his own time. But he gave his U.S. history teacher credit for his ability to answer a question Friday about Andrew Jackson, the seventh president of the United States. "My teacher emphasizes places quite a lot," said Anthony. "For my school, I think we've got [geography] covered." Here are some sample questions from the National Geographic Bee for fourth- through eighth-graders. For the answers, see the other box. 1 • Which city gets more annual rainfall: Portland, Ore., or Wichita, Kan? 2 • McMurdo Sound, which has served as a base for Antarctic expeditions, is an inlet of what sea? 3 • Hunting and trading of clouded leopards is illegal in a small Asian country that borders only the state of Sarawak and the South China Sea. Name this country. 4 • Which country has a longer coastline: North Korea or Philippines? 5 • The Atacama Desert is located along the western coast of which continent?